Dr. Noyongoyo is an Assistant Professor of Sociology. He has conducted his research on international students eating habits as part of his interests for food and social inequalities. His research suggests that there is deep connection between every day food practices and academic life. He teaches introduction to sociology, research methods, and statistics for social sciences. 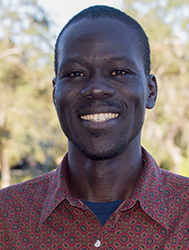 When he is not engaged in sociological research and teaching, Dr. Noyongoyo teaches French and Italian.